Asha Thomas wears #1 on her jersey, and now she’s at the top of the Cal record books. Thomas scored 29 points, hitting a record nine three pointers, as the No. 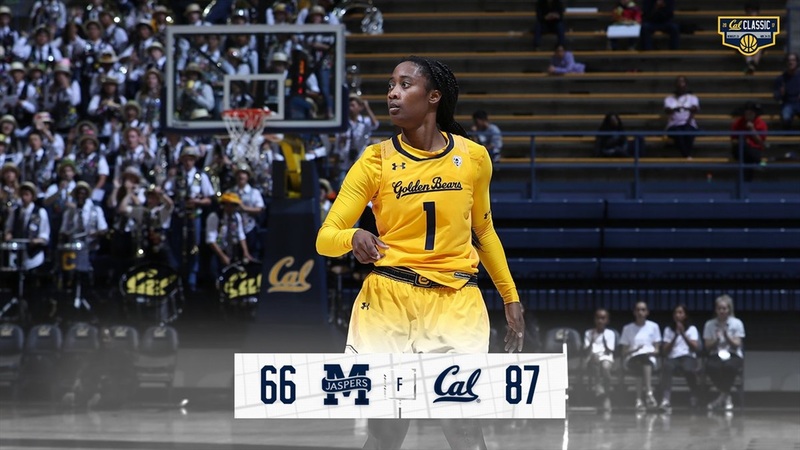 21/23 California Golden Bears led nearly wire to wire, defeating Manhattan 87-66 in the opener for the Cal Classic. Thomas now holds the program record for most threes in a game, passing Paige Bowie. Buoyed by her efforts, the Bears also broke the record of most threes in a game, hitting 17 on 27 attempts. Freshman Kianna Smith had four threes of her own on her way to 17 points. Smith also notched 12 assists. The Bears had 30 assists on 32 made baskets, on their way to shooting 55% for the game. The Cal bench had a stellar game. CJ West made five of six shots for 12 points in 16 minutes, and Mo Mosley had eight in seven minutes of play. Manhattan had four players who scored in double figures, led by Kayla Grimme’s 16. But the Bears turned Grimme into an inefficient volume shooter, as the center only made five of 20 shots. But the story of the game was Cal’s offense. And of course, Asha Thomas. Gottlieb pointed out that the Jaspers had two players on Anigwe at all times. As a result, Anigwe only had three points in the game. The game opened with a long-distance shooting exhibition, auguring things to come, as both teams took turns hitting threes. Asha Thomas hit three treys in the first two minutes, only to have the Jaspers match her shot for shot. Manhattan took an 11-9 lead on a jumper by center Alex Smith, but it was the only lead the Jaspers would have in the game, as Thomas promptly knocked down yet another three. But as the Bears have shown so far in this young season, Cal is prone to scoring droughts. For the next four minutes, the Bears missed five shots from the field and two free throws. Cal also turned the ball over five times in that stretch, compounding their mistakes by allowing easy baskets on the other end. Manhattan took advantage, converting Cal’s miscues into a 13-0 run, powered by five points from Cajou and two steals from Tatum, to pull within 40-38. Gottlieb called time and re-inserted Davidson, who paid immediate dividends, scoring twice from the paint, including a finger roll off a touch pass from Mikayla Cowling. Cowling had eight assists in the game. Thomas hit her seventh three of the half, and the Bears had righted the ship. For the half, Cal hit 10 of 14 from beyond the arc. Thomas hit seven of her nine attempts. The Bears’ emphasis on the perimeter was so complete that Kristine Anigwe had only one shot attempt in the first 20 minutes. Thomas missed her first shot of the second half, but Smith continued her perfect marksmanship from outside, knocking down her third three to stretch the lead back to double digits, 50-40. Thomas hit her eighth three, tying the Cal single-game record, and CJ West found room down low for consecutive baskets. Mo Mosley joined the party, hitting a corner three of her own. Anigwe hit a jumper from the elbow, and Cal ended the third up 64-51. After decisive ball movement by the Bears, Smith hit another wide-open three to open the fourth. West worked hard to get open underneath the basket, and Mosley found her, and the Bears had their largest lead of the game 70-53, with seven and a half minutes to play. West then returned the favor, finding a cutting Mosley for a layin. The partnership worked again, this time getting West to line, where she hit both to push the lead to 21, 74-53. Manhattan pushed back with a three from Tatum and a three-point play from Grimme. The Jaspers also found success getting to the line, with Tatum’s free throws whittling the lead to 78-65 with 3:43 left. The Bears ran the clock down and Jaelyn Brown hit a three; it was the Bears’ 15th of the game, breaking the program record. With 1:41 left and the Bears leading 81-65, the only question remaining was whether Thomas would get her record. Thomas made good on her next opportunity, and her corner three with 1:11 left got it done. Sara Anastasieska hit one more for good measure, and the Bears closed out a dominant win. Cal moves on to the championship game to face No. 23 Missouri, at 2pm on Saturday, November 25. The Tigers beat Coppin State 73-50 in the late game, led by Sophie Cunningham's 15 points and a 45-25 rebounding advantage.